I started with the wrapping paper and went from there. Haven't made a baby anything in quite some time. Fun! This is really cute. 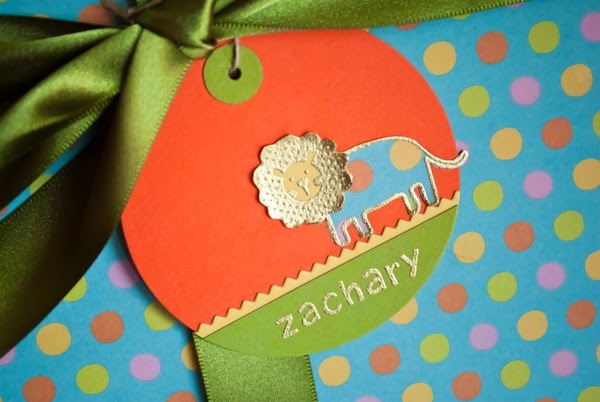 That lion looks great embossed in gold, and all together, it is a lovely presentation. 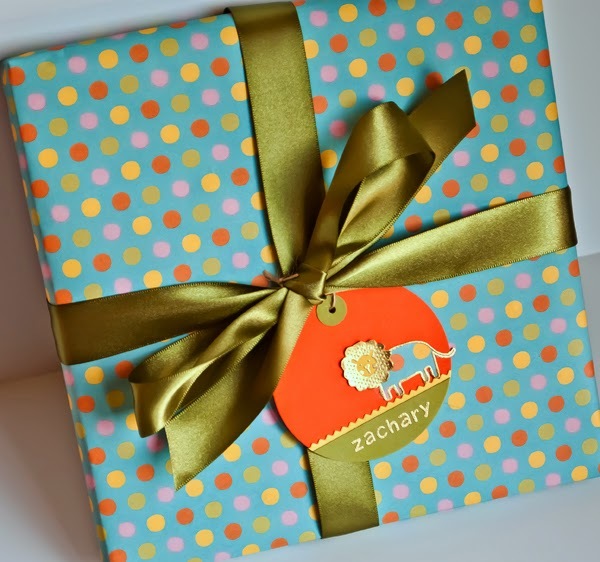 I love the use of gold embossing with the patterned paper. So perfect! LOVE the rich colours for a baby - so clever and modern looking! This is an "Awwww" project. Simply too darned cute. I'm loving your Design on a Dime Series. Dawn is one of my faves. Hope you had a chance to spend a bit of time with your son or are looking forward to his being home really soon. we visited him in texas a couple of weeks ago. miss him!! LOVE the bright colors! The tag is too cute. The gold embossing looks great on the paper and the lettering is lined up perfectly. Super idea for a tag! I had read that the lawn fawn alphabets were easy to line up and they are. each letter is surrounded by a rectangle of polymer, so if you are careful to place on a line (a gridded block helps) it is fairly easy to get a straight word.